Moth Man -- 2010 Season. June 5: First emergence reported to me from Eden Prairie Minnesota. June 11: First emergence at my place ( Madison, Wisconsin) One male. June 13: Cecropia question from Morgantown, WV. 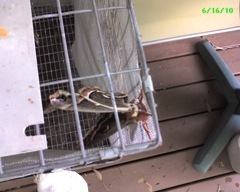 June 15: Two more males and One Female. June 17: Alas! I was trying to respect the couple's privacy and decided to wait till the couple had finished to move the female to paper bag - to deposit her eggs. Long story short - she had escaped from my cage before I could gather any of her eggs. Hopefully she made it safely to a tree (or number of trees) in the area to lay her eggs in nature. June 21: Fearing that I would be without any Moths to raise for the first time in 10 years, I contacted Paul Williams who has given me some eggs from his brood (both Cecropia and Promethia). THANK YOU Paul! June 22: FIRST Promethia emerges. Male. I'll keep the cage doors closed this time. 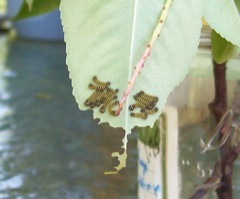 June 23: First Cecropia eggs hatch (laid June 11). 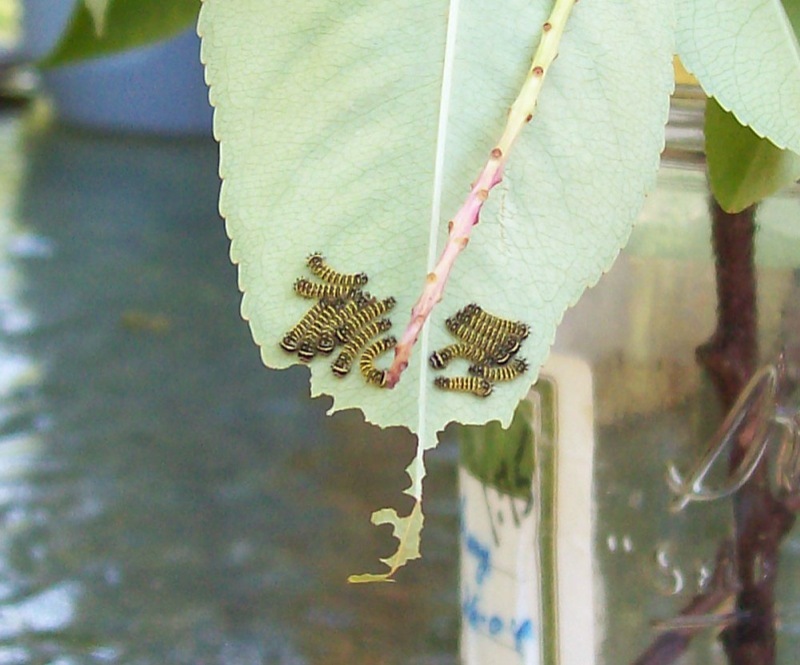 June 24: Second Cecropia eggs hatch (laid June 12). Aprox. 1/2 eggs failed to hatch from this batch. June 25: Released last of Prometheus moths - all male this year - hope they find a mate. June 27: Promethia eggs hatch. August 13: All but one Cecropia have spun up a cocoon. This is almost a month ahead of normal (IMHO). Thanks for all the information you provided in your last email. It was very helpful. My caterpillar, Rupert, emerged from his cocoon this past Saturday and he flew away early yesterday evening. It was an amazing experience. I miss him already! I was wondering if all of your eggs this year are claimed. If not, I was wondering if I could have some... I guess depending where in Wisconsin you live. I would be willing to drive out and pick them up if you aren't too far from the Twin Cities. Thanks Stuart and have a great day! None of my cocoons have popped yet. Did you have Rupert outside? This is good news and I'll start watching more closely. I live in Madison but we spend a lot of time in the St. Croix Falls area. I can send you some eggs through the mail (they travel well) if you give me an address. Glad to have your help spreading the word. Woohooo! I am so excited. Thank you so much! I have a few kids who would also like to raise them so I will be able to provide them with a couple of caterpillars and some guidance. The info I was provided with at the fair was completely inaccurate. I am thinking I might make up a tip sheet for the Butterfly Hut to hand out with the caterpillars. I hate to think the caterpillars might be dying because the people don't know what to do with them. I did have Rupert outside. After checking out another web site it appears Rupert was really Ruby. She had very short and fine antennae so I am assuming she was a "she" - plus she had a really big abdomen. I put Ruby outside right after I got your last email. We had a very warm spring. I got impatient (and overly curious) and opened up the outer cocoon. I wanted to make sure she was still alive. I had her laying somewhat exposed (but highly protected) for about two weeks. I kept her in an aquarium with a flour sack dishtowel over the top on a protected section of my deck. I hope she didn't hatch too early! The good thing is that the caterpillars live in my town home area naturally. I usually find one or two each summer. It was a very rainy weekend so that might have kept the males away. I think Ruby took off in search of a male. My dad is going to build me a big screened cage for me to set on my deck. At first people think I am crazy when I say I am raising caterpillars but when I start talking about them people really become quite fascinated. I sent Kate a link to a neat little pamphlet that was put together by Dr. Paul Williams. This is a nice introduction to raising these moths. Click here to download a PDF version for yourself. First moth emerges (my back yard). Not a very good photo this year. I stumbled upon your web site while investigating which moth had laid some eggs in the garage next to my apartment. 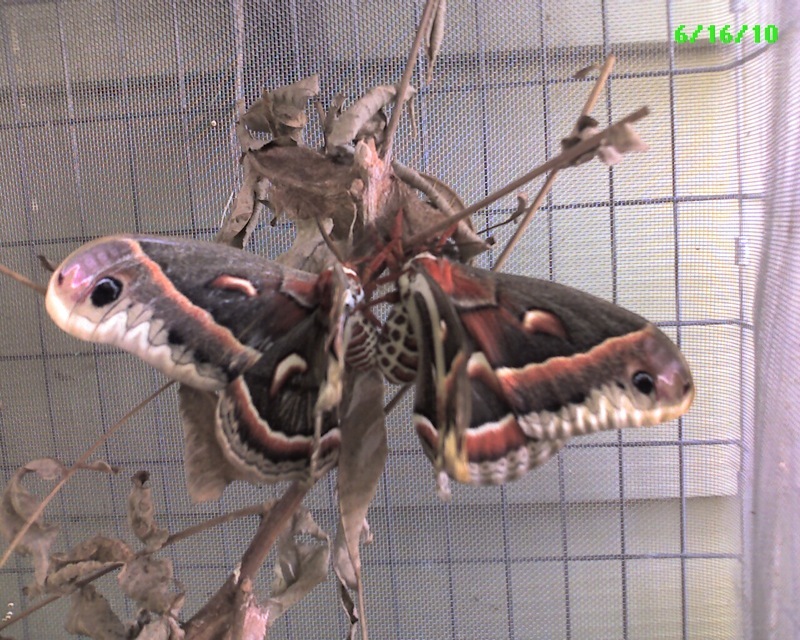 I had taken a picture of the moth (see attached) and it appears to me to be a Cecropia Moth. I noticed it laid a string of eggs on a cement pole in the garage. I wanted to try to relocate the eggs but I saw on your site that the eggs are connected by a very sticky substance. I wasn't sure if it would damage them by moving them. They are right by the ground where the cleaner comes by and I am just worried they will be swept away and killed. 10 feet in any direction and it would have been in the forest. I just feel bad for the eggs! Any advice? 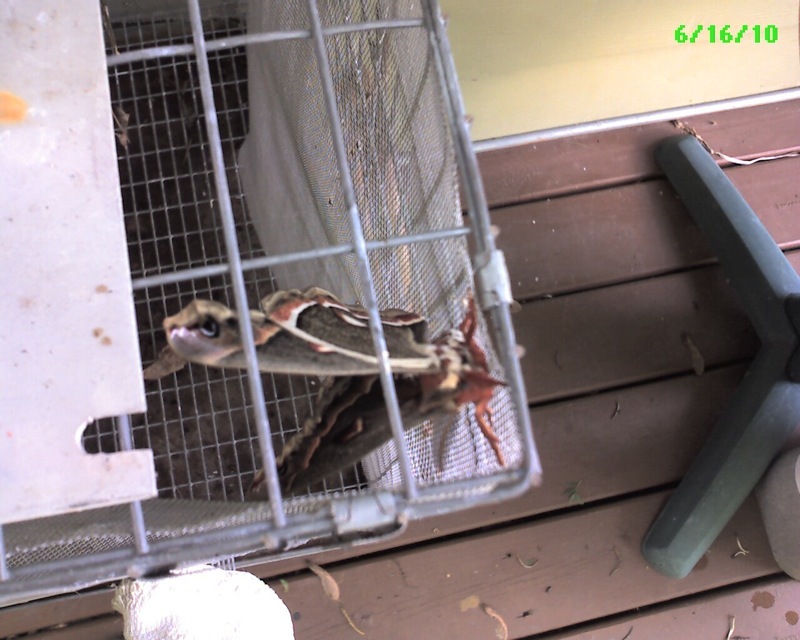 Also the moth itself isn't looking too hot.� I read online they only live a week or so. Maybe this particular one is winding down. It's wings were somewhat folded at the edges and crumpled up. Interesting story. I'm glad you found my site useful. I agree with your identification. It's strange she would have chosen a concrete pole if she had other options. Is the garage closed in? 1. Females will lay eggs whether they have mated or not (was there a male around?) but if no male the eggs will be sterile. If she is free to roam she should have spread eggs around to some of those trees as well - they lay about 100 eggs. I would be worried too about moving the eggs. If they are fertile they will start emerging in about a week and the little guys will be hard up for food. Doesn't look good all around. 2. Where are you located geographically? My first moth emerged yesterday and it was a male. It's early this year for us to see these come out but it's been a warm spring. Thanks for writing. These are amazing creatures and I'm always learning new things about them. I am in Morgantown, WV. I didn't notice on your site, but where are you located? It looks like from what I've read these moths have a good range but I had never seen on before...especially this large. I measured a 6 inch wingspan. The garage is a huge open garage with big open walls and tons of space to get out. I first noticed the moth at about 10 this morning, as of 11pm it was in the same spot on the same concrete pole. From the time I spotted it until just a half our ago, it looked like like it was demonstrating some nervous behavior. Like I said, the wing tips appear to be crumpled up a bit and she won't fly away.� She doesn't even appear to get off the ground when she flaps.� The string of eggs contained about 15 in total.� There are plenty of forests and woods all around...so maybe she laid some there before getting stuck in the garage! I"ll keep an eye on the eggs...if I notice any little ones emerge I'll move them into the forest. We're surrounded by lots of maple trees. Thanks for the response...I've never had any kind of ongoing interest in moths, I just happened to notice it (as did my dogs) and I just found your site while I was looking for information! This was the last I saw of my female this year. I usually carefully move the mating pair into a paper bag so she will lay her eggs (or at least as many as I need) before I release her into the neighborhood. This year I decided to respect their privacy and wait till they were finished mating. I kept checking on their progress but the last time I checked she had already finished and managed to find her way through the bars and escape into the wild. Due to my problems with earwigs last year; eating all the young caterpillars in 3 out of 5 of my 'bags', I only had one female emerge. So this year may mark the first year in 11 years raising these moths, that I don't have any to raise. Emergency shipment of eggs to get me back in 'production'. The Cecropia eggs (left) were laid June 11 and June 12. The Promethia eggs (Right) were laid on June 16. Mal-formed Cecropia emerges with only partially formed wings. This poor moth (female) emerged without fully developed wings. Her right wing is actually caught inside the cocoon and she is struggling to get it free. I had to carefully cut a slit in the cocoon and help her get it out. Even so, both wings are only partially formed and she is unable to expand them. I placed her back in the cage to see if she would still attract a male. It may be to late in this 'early' season for males to be flying around in the wild. Alas, none came to visit. Promethia Moths start to emerge in my back yard. First Promethia Moth emerged as a male. I had about given up on these but I've learned not to worry. So, welcome. Over the next two days, two more males have emerged. No female here so I'll count my cocoons and if there are none left I will open the door and let these guys go free. Hey girl, you're a little late. This female waited till July 1, 2010 to emerge from her cocoon. I was afraid she would be too late to attract any males from the environment. But within 4 hours (at around 5:00 PM) we had 3 males flitting around the cage. This is an amazing feeling for those of you who have never seen it. It's magical. It's simply amazing. I have seen it a hand full of times since I've been raising these moths and I never get over it. The two males in this picture arrived within 5 minutes of each other and they pretty much found the female at the same time. One approached from one end and the other - the other. It took less than a minute to determine the winner. Simply amazing! The third male flew around for a few minutes but he didn't hang around. I assume once mating starts the pheromones stop. By 9:00 PM they had finished mating and I put her in a bag to collect some of her eggs before I let her go. Newly hatched and second instar. The Cecropia tend to be loners. The one pictured in the middle has already shed his first skin. They grow so fast, don't they?